Review posted February 23, 2018. Avery (Penguin), 2012. 275 pages. A big thank you to my friend Kevin, who recommended this book to me more than once. When Kevin out-librarianed me and recommended it to someone else as among three books that help build leadership skills, I finally took note enough to put it on hold. This book is similar to The Four Tendencies, by Gretchen Rubin, in that both talk about motivation and getting done the things you want to do, but The Willpower Instinct is more helpful and more comprehensive. Although The Four Tendencies has the fun side of trying to tell you something about yourself, The Willpower Instinct is more science-based, and everyone will find insights about willpower that they can use among this wealth of material. The Four Tendencies made me think, “I’m an Upholder! I will do what I want to do!” The Willpower Instinct showed me exactly how I fool myself. For example, I learned about moral licensing and why thinking about getting up in the morning makes me feel like I can reward myself by falling back asleep. Kelly McGonigal teaches a popular class on the science of willpower at Stanford. She offers actual science about the various self-control challenges we face. “I will” and “I won’t” power are the two sides of self-control, but they alone don’t constitute willpower. To say no when you need to say no, and yes when you need to say yes, you need a third power: the ability to remember what you really want. I know, you think that what you really want is the brownie, the third martini, or the day off. But when you’re facing temptation, or flirting with procrastination, you need to remember that what you really want is to fit into your skinny jeans, get the promotion, get out of credit card debt, stay in your marriage, or stay out of jail. Otherwise, what’s going to stop you from following your immediate desires? To exert self-control, you need to find your motivation when it matters. This is “I want” power. Willpower is about harnessing the three powers of I will, I won’t, and I want to help you achieve your goals (and stay out of trouble). As we’ll see, we human beings are the fortunate recipients of brains that support all of these capacities. In fact, the development of these three powers – I will, I won’t, and I want – may define what it means to be human. Before we get down to the dirty business of analyzing why we fail to use these powers, let’s begin by appreciating how lucky we are to have them. We’ll take a quick peek into the brain to see where the magic happens, and discover how we can train the brain to have more willpower. We’ll also take our first look at why willpower can be hard to find, and how to use another uniquely human trait – self-awareness – to avoid willpower failure. Since self-awareness does help avoid willpower failure, reading this book, and learning the ways we trick ourselves, is a great way to build that self-awareness. In the section on the physiology of self-control, we learn that in today’s world, we need a pause-and-plan response more than a fight-or-flight response. The pause-and-plan response puts your body into a calmer state, but not too sedate. The goal is not to paralyze you in the face of internal conflict, but to give you freedom. By keeping you from immediately following your impulses, the pause-and-plan response gives you the time for more flexible, thoughtful action. From this state of mind and body, you can choose to walk away from the cheesecake, with both your pride and your diet intact. We also learn that willpower is a muscle. It can be strengthened with exercise, but can also grow tired. When our body has energy, it will do better. There’s even a physical test – heart rate variability – which you can use to predict who will resist temptation and who will give in. The author has plenty of ideas for how you can build up your physical willpower reserve. Then there is the chapter on moral licensing. When you do something good, you feel good about yourself. This means you’re more likely to trust your impulses – which often means giving yourself permission to do something bad…. Moral licensing doesn’t just give us permission to do something bad; it also lets us off the hook when we’re asked to do something good. For example, people who first remember a time when they acted generously give 60 percent less money to a charitable request than people who have not just recalled a past good deed. In a business simulation, managers of a manufacturing plant are less likely to take costly measures to reduce the plant’s pollution if they have recently recalled a time when they acted ethically. . . .
To avoid the moral licensing trap, it’s important to separate the true moral dilemmas from the merely difficult. Cheating on your taxes or your spouse may be morally flawed, but cheating on your diet is not a mortal sin. And yet, most people think of all forms of self-control as a moral test. Giving in to dessert, sleeping late, carrying a credit card balance – we use them to determine whether we are being good or bad. None of these things carry the true weight of sin or virtue. When we think about our willpower challenges in moral terms, we get lost in self-judgments and lose sight of how those challenges will help us get what we want. Another chapter talks about how attracted we are to the promise of reward – even if the reward itself doesn’t turn out to be all that wonderful. And she discusses how retailers use this to manipulate us. Make us think we’re “saving,” and we’ll spend more! But she also suggests using this on yourself – come up with a reward for your “I will” challenge, and “dopamize” the task. Suddenly, it will be much more attractive. But another thing that leads to giving in is feeling bad. Why does stress lead to cravings? It’s part of the brain’s rescue mission. Previously, we saw how stress prompts a fight-or-flight response, a coordinated set of changes in the body that allows you to defend yourself against danger. But your brain isn’t just motivated to protect your life – it wants to protect your mood, too. So whenever you are under stress, your brain is going to point you toward whatever it thinks will make you happy. Neuroscientists have shown that stress – including negative emotions like anger, sadness, self-doubt, and anxiety – shifts the brain into a reward-seeking state. You end up craving whatever substance or activity your brain associates with the promise of reward, and you become convinced that the “reward” is the only way to feel better. This same chapter explains why guilt is not a good motivation to change, and why berating yourself for past behavior doesn't help. Whatever the willpower challenge, the pattern is the same. Giving in makes you feel bad about yourself, which motivates you to do something to feel better. And what’s the cheapest, fastest strategy for feeling better? Often the very thing you feel bad about. What’s more, when experimenters gave subjects the message not to be too hard on themselves, that everyone indulges sometimes – encouraging them to forgive themselves – subjects were far less likely to overindulge in the next part of the test. If you think that the key to greater willpower is being harder on yourself, you are not alone. But you are wrong. Study after study shows that self-criticism is consistently associated with less motivation and worse self-control. It is also one of the single biggest predictors of depression, which drains both “I will” power and “I want” power. In contrast, self-compassion – being supportive and kind to yourself, especially in the face of stress and failure – is associated with more motivation and better self-control. Consider, for example, a study at Carleton University in Ottawa, Canada, that tracked the procrastination of students over an entire semester. Lots of students put off studying for the first exam, but not every student made it a habit. Students who were harder on themselves for procrastinating on their first exam were more likely to procrastinate on later exams than students who forgave themselves. The harder they were on themselves about procrastinating the first time, the longer they procrastinated for the next exam! Forgiveness – not guilt – helped them get back on track. These findings fly in the face of our instincts. How can this be, when so many of us have a strong intuition that self-criticism is the cornerstone of self-control, and self-compassion is a slippery slope to self-indulgence? What would motivate these students if not feeling bad for procrastinating the last time? And what would keep us in check if we didn’t feel guilty for giving in? Surprisingly, it’s forgiveness, not guilt, that increases accountability. Researchers have found that taking a self-compassionate point of view on a personal failure makes people more likely to take personal responsibility for the failure than when they take a self-critical point of view. They also are more willing to receive feedback and advice from others, and more likely to learn from the experience. Another chapter looks at our tendency to believe Future Me will take care of whatever challenges come their way. It gives us some strategies for delaying gratification for a bigger reward. 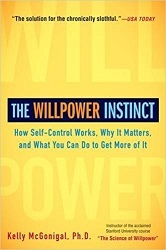 Yet another chapter looks at how Willpower is contagious, and ways you can use this to your advantage. (Okay, maybe the people that Gretchen Rubin calls “Obligers” will benefit most from this chapter.) But yes, telling someone about your goals – or being around other people who meet goals – will help you meet those goals. This chapter confirms that self-scolding simply makes you think all the more about the forbidden thoughts. Trying not to think about something guarantees that it is never far from your mind. This leads to a second problem: When you try to push a thought away, and it keeps coming back to your mind, you are more likely to assume that it must be true. Why else would the thought keep resurfacing? We trust that our thoughts are important sources of information. When a thought becomes more frequent and harder to pull yourself away from, you will naturally assume that it is an urgent message that you should pay attention to. How can you find your way out of this confounding dilemma? Wegner suggests an antidote to ironic rebound that is, itself, ironic: Give up. When you stop trying to control unwanted thoughts and emotions, they stop controlling you. Studies of brain activation confirm that as soon as you give participants permission to express a thought they were trying to suppress, that thought becomes less primed and less likely to intrude into conscious awareness. Paradoxically, permission to think a thought reduces the likelihood of thinking it. This solution turns out to be useful for a surprisingly wide range of unwanted inner experiences. The willingness to think what you think and feel what you feel – without necessarily believing that it is true, and without feeling compelled to act on it – is an effective strategy for treating anxiety, depression, food cravings, and addiction. As we consider the evidence for each, we’ll see that giving up control of our inner experiences gives us greater control over our outer actions. If there is a secret for greater self-control, the science points to one thing: the power of paying attention. It’s training the mind to recognize when you’re making a choice, rather than running on autopilot. It’s noticing how you give yourself permission to procrastinate, or how you use good behavior to justify self-indulgence. It’s realizing that the promise of reward doesn’t always deliver, and that your future self is not a superhero or a stranger. It’s seeing what in your world – from sales gimmicks to social proof – is shaping your behavior. It’s staying put and sensing a craving when you’d rather distract yourself or give in. It’s remembering what you really want, and knowing what really makes you feel better. Self-awareness is the one “self” you can always count on to help you do what is difficult, and what matters most. And that is the best definition of willpower I can think of. I highly recommend this book, if you have willpower challenges, or even if you think you don't. There are many more ideas and many more descriptions of fascinating studies all about doing what we really want to do.